Citation Information: J Clin Invest. 2005;115(2):451-458. https://doi.org/10.1172/JCI22324. Advanced congestive heart failure is associated with activation of the renin-angiotensin system and skeletal muscle wasting. 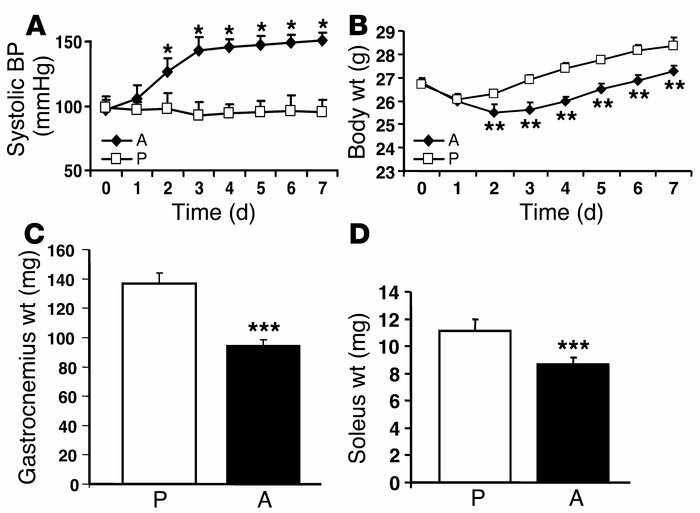 We previously showed that angiotensin II infusion in rats produces cachexia secondarily to increased muscle proteolysis and also decreases levels of circulating and skeletal muscle IGF-1. Here we show that angiotensin II markedly downregulates phospho-Akt and activates caspase-3 in skeletal muscle, leading to actin cleavage, an important component of muscle proteolysis, and to increased apoptosis. These changes are blocked by muscle-specific expression of IGF-1, likely via the Akt/mTOR/p70S6K signaling pathway. We also demonstrate that mRNA levels of the ubiquitin ligases atrogin-1 and muscle ring finger–1 are upregulated in angiotensin II–infused WT, but not in IGF-1–transgenic, mice. These findings strongly suggest that angiotensin II downregulation of IGF-1 in skeletal muscle is causally related to angiotensin II–induced wasting. Because the renin-angiotensin system is activated in many catabolic conditions, our findings have broad implications for understanding mechanisms of skeletal muscle wasting and provide a rationale for new therapeutic approaches. Angiotensin II produces muscle wasting in mice. C57BL/6 mice were either angiotensin II infused or sham infused and pair fed. Angiotensin II (A) markedly increased blood pressure (*P < 0.001, angiotensin II–infused vs. pair-fed), (B) produced relative weight loss (**P < 0.01 angiotensin II–infused vs. pair-fed), and (C and D) reduced muscle mass (***P < 0.05, angiotensin II–infused vs. pair-fed). A, angiotensin II–infused; P, pair-fed.